An emerging ladies clothing brand Riaz Arts instantly growing in the world of fashion and now have the exceptional position in the hearts of Pakistani community. The brand are manufacturing several designer wear clothing line for women and launched every season. Their famous designer product line is Charizma. Riaz Arts recently launched its spring summer collection under the label of Charizma. You can check here complete latest collection of Charizma Spring Summer Lawn Collection 2015 that got colossal of success and demand in all cities of Pakistan, now mostly designs are out of stock in Charizma spring summer lawn designs. 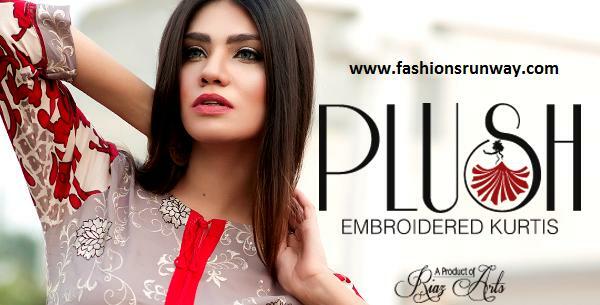 Now the brand is on its second move for the same season with its new and unique brand name that is Plush by Riaz Arts. Another brand name by Riaz Arts to the ladies of Pakistan and introducing new and unique embroidered kurtis summer collection 2015 that is manufactured with lawn fabric. The collection is entitled as Plush by Riaz Arts Embroidered Kurtis Collection 2015. Indispensable dress colour ranges that every woman should possess comprise white, sky blue, pink, purple, grey, white, majenta, brown, red, orange, parrot, yellow and green. Plush by Riaz Arts Embroidered Kurtis Collection 2015 not in stores now, stay tuned on this page to see the complete collection of Plush embroidered kurtis for women. Available in all leading stores very soon. Fashions Runway is always here to presents all designer lawn collection for Women. Now proudly presents PLUSH spring summer kurtis designs for girls. Check below here Pakistan’s leading brand PLUSH by Riaz Arts emrboidered kurtis spring summer lawn collection 2015 for women. See complete magazine catalogue designs for women by Plush clothing brand. You can contact to the officials of Plush clothing brand by following the given detail. Interested in buying the kurtis. Wanted to know in details about the material , work , and price. Interested in buying the kurtis. Wanted to know in details about the material and price.